It was only a matter of time before I put together a Jane Austen bookshelf. I love Jane Austen. I am one of those people. I agonize over which is my favorite novel. Always Persuasion unless I have just re-read Pride & Prejudice. Which Telfer also loves. We didn't name Jane after Jane Austen necessarily but…there might have been a small niggling thought there. Jane Austen's Letters | Folio Society Edition | I have a Folio Society addiction. Such beautiful bindings. They don't really hold their value but they are so pretty. I swear, Jane Austen wrote to her sister Cassandra mainly about dresses, fabric and bonnets. A Truth Universally Acknowledged: 33 Great Authors on Why We Read Jane Austen | Susannah Carson, editor | Strangely, Susannah was the other girls name I LOVED. Telfer, not so much. Jane's Fame: How Jane Austen Conquered the World | Claire Harman | I really loved this examination of the lasting influence of Jane Austen and her novels. Very well written and I bought it in New York at one of my favorite bookstores with Anna & Amanda. Pride & Prejudice: A Bed Book | Jane Austen | I bought this at Dutton's in LA before they went under. Seriously. The book is printed sideways so you can read it comfortably in bed. I couldn't pass this up. They have a whole range of titles and it has taken everything in me to not order more. Remarkably Jane | Jennifer Adams, editor| Such a cute little book. Chairs on the cover. My favorite quote: "I love structure in the novel. It's not surprising that overwhelmingly my favorite novelist is Jane Austen – structure is tremendously important to her. I love the idea of bringing order out of disorder, which is what the mystery is about." PD James. Not surprisingly then, PD James is my favorite mystery novelist. Jane Austen's Guide to Dating | Lauren Henderson | The title says everything that needs to be said. Persuasion | Jane Austen | I have several copies of every novel but this is probably my favorite copy. I like the size and the way it feels. Pride & Prejudice & Zombies | Jane Austen & Seth Grahame-Smith | Mildly entertaining but mostly I just like the cover art and the idea of this. Sense & Sensibility & Sea Monsters | Jane Austen & Ben Winters | A gift. Don't think I will ever read it but again, the cover makes me laugh. Sandition & Other Stories | Jane Austen | A couple novels that Austen never finished. Haven't read because I'd like to think there's something out there I haven't read yet. The Jane Austen Miscellany | Lesley Bolton, editor | The illustrations from early editions of the novels are pretty much the best thing about this little book. Jane Austen's Guide to Good Manners | Josephine Ross, editor | My mom bought me this book, probably in the attempt to improve my manners. Persuasion | Jane Austen | Missy just gave me this copy of Persuasion. Oh my. It's lovely. It's a Penguin Red Classic. 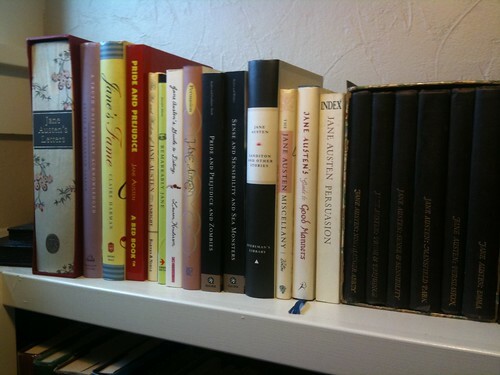 Set of Novels | Jane Austen | My mom found this set of all of the novels in a junk store in Hermiston, Oregon. It's something I would save in a fire. I love it so much. You can't tell from the picture how cute the boards of the books are – each has a different, cheery color. Almost like wallpaper. I own a copy of Pride & Prejudice & Zombies that my sister-in-law gave me. I can’t bring myself to read it!